sounds pretty cool, i'd still say if you need an app to find products in a store then the store design is wrong, however given some of the large tesco stores are the size of a small village that becomes much harder! I’m curious to know what kind of accuracy you’d get with just WiFi only positioning. 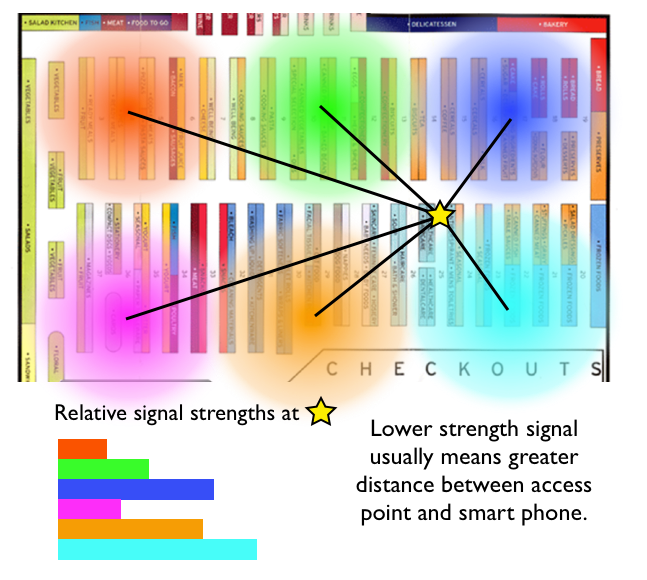 Is the accuracy greater inside a large store than say outside? Also would this system be able to distinguish which floor a customer is on for those Tesco stores that have more than one floor? Maybe you are chasing the wrong rabbit? RDF to floorplans as svg for smartphones. It's interesting as this problem is relevant to museums and gallaries who want to use mobile devices to guide and to tell people what they are looking at! Saad, first of all yes the Wifi triangulation should work as well in 3D space as it does in 2D space. I'll be designing for 3D space although in reality groceries are normally only sold "downstairs" on the main shop floor. As for wifi inside accuracy vs outside accuracy, I think it should be about the same. The access points tend to be mounted in the ceiling inside a Tesco store which tends mean more likelihood of line-of-sight access to the signals because they are coming down from above, so to speak. PaulG - thanks, I'll look into this although my plan is to send the store plan data down to the phone in JSON format which has less 'scaffolding' around the data than XML/RDF. Christopher - yes museums and galleries could use this method although don't think the accuracy is enough for your phone to work out accurately what painting you're standing in front of in order to trigger the correct commentary. Darren - I think turn by turn descriptions to get to the product requires an accuracy we can'y provide. This is more about augmenting information Tesco Finder already provides today - "Aisle 23 on the left side counting 3 units along then the 4th shelf up from the floor". Customers could get "special offers around me" - I think that's a more useful use! RDF derived from products I meant, though could be product groups I guess. Nick, I'd expect that some sort of error correction algorithm should be able to filter out problems with signal absorption and reflection. Provided that you have more than 3 points of triangulation, as you suggest you do, the algorithm could discard the error data, yet still provide good results. 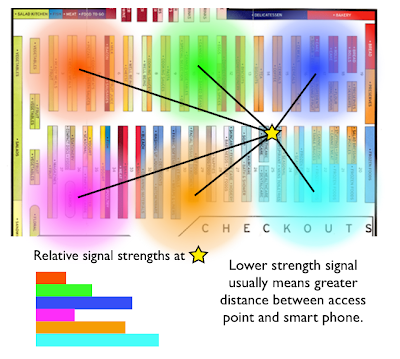 You could augment wifi triangulation by using the accelerometer and digital compass in many modern smartphones and a very low-tech option would be some QR/barcodes at strategic locations, like the store entrance, to act as 'start points'. I think that this is wonderful news and long overdue. I only discovered this amazing site yesterday but a few days ago rang head office begging for a planogram of my local TESCO store. There is nothing more irritating that searching for items when you are in a tearing hurry and cannot locate a member of staff! Let us hope that Apple welcome this and take it as one of their Apps. Can you perhaps explain why our mobile signals get blocked within your Tesco Stores? My other half has to completely leave the store to phone me to ask me if he can get "so and so instead of so and so" when he's shopping for me! It's the same with my network too, in fact I've looked into it and people on every network complains that Tesco seem to be blocking their signal.